I don’t know if everyone has stockings, but it’s a bit of a tradition over here. I’ve found some really cute things that would be great for stockings or even secret Santas! I’ve seen these Pom Pom key rings everywhere! I love all of the colours and they’re just so cute. I have two already! They add the finishing touch to a bag and look really cute on your keys too. This snowflake bracelet is really festive and comes in three colours – gold, rose gold and silver. Rose gold is really on trend at the moment as is being used on everything. This bracelet is really dainty and pretty. I’ve been dying to get my hands on one of these cases! They’re so so cute! You can also buy similar ones at new look and skinny dip. They’re not subtle at all, but who cares when they’re this cute? Everyone raves about candles, I think they’re a lovely present if you can choose the right smell. I smelt this one in new look and it is so lovely, it’s quite floral and light, not sickly sweet at all. The packaging is simple and cute too. This is probably more of a present but I couldn’t not add it in. Big companies make so many gift sets at Christmas. My personal favourites are the benefit ones that include all of their signature products. This soap and glory one is amazing! 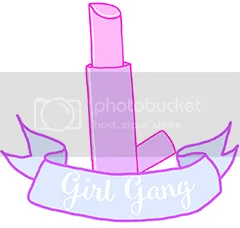 It includes :SOAP & GLORY™ THICK & FAST™ HD Mascara in Film Noir, SOAP & GLORY™ SMOULDER KOHL™ Waterproof Eyeliner Pencil in Superblack, SUPERCAT™ Extreme Eyeliner Pen in Carbon Black, SOAP & GLORY™ ARCHERY™ Brow Tint & Precision Shaping Pencil in Brownie Points. How good does that sound! Soap and glorys eye products are really amazing too! Have you guys got a Wishlist for Christmas? Hiiiii! I know this post is set out differently and all that but I’m going to start posting a few more of my outfits as I’m in looove with clothes. I also love making my own outfits up and putting pieces together. 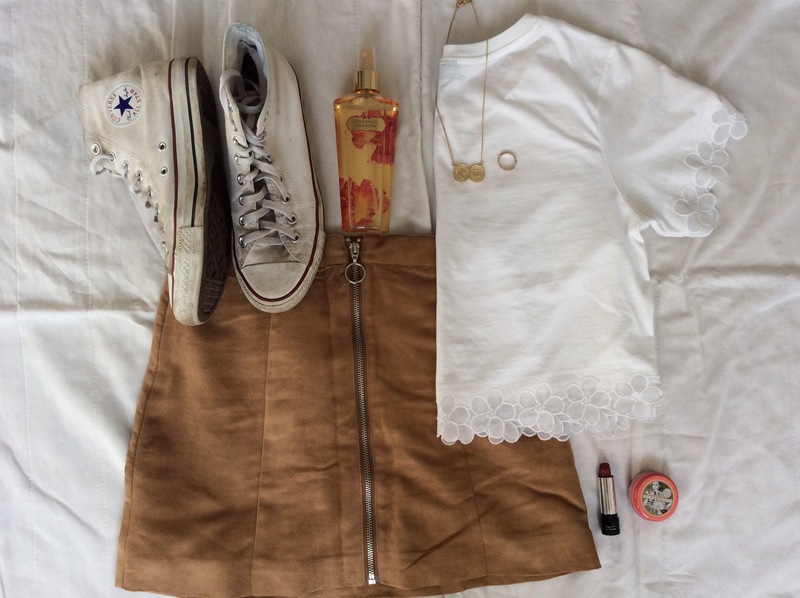 Suede is great for festivals and is really in this season. My favourite thing about this skirt is the zip. I love the circle at the top. It looks a lot more expensive than it was. They’re everywhere at the moment. Especially in places like topshop, asos and newlook. 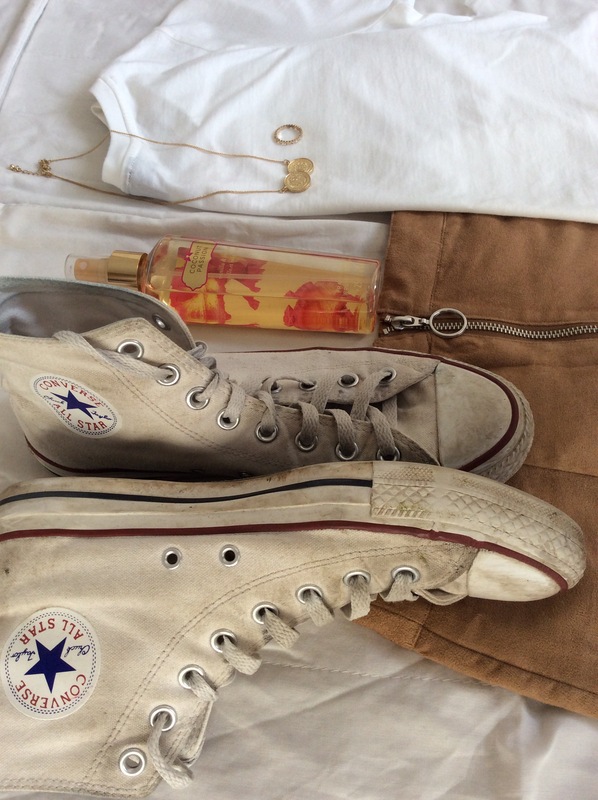 My converse are sooooo old and dirty. I do prefer them to look a bit dirty rather than ‘pristine white’. Hopefully this summer I’ll get some new ones. I might go for the lower ones because I haven’t had them yet. Victoria’s Secret ‘coconut passion’ is perfect for summer because the tropical scent of coconut but is still sweet because it smells like vanilla too. It’s my favourite scent! I think gold jewellery goes with this outfit because of the neautral colours. It stands out against the white and looks really pretty. This coin necklace is from miss selfridge and the ring is from river island. They add detail to a simple outfit. Yay for soap and glory! This lip balm is very moisturising. I apply it at night because it can be sticky. Then, when I wake up in the morning my lips are super soft! 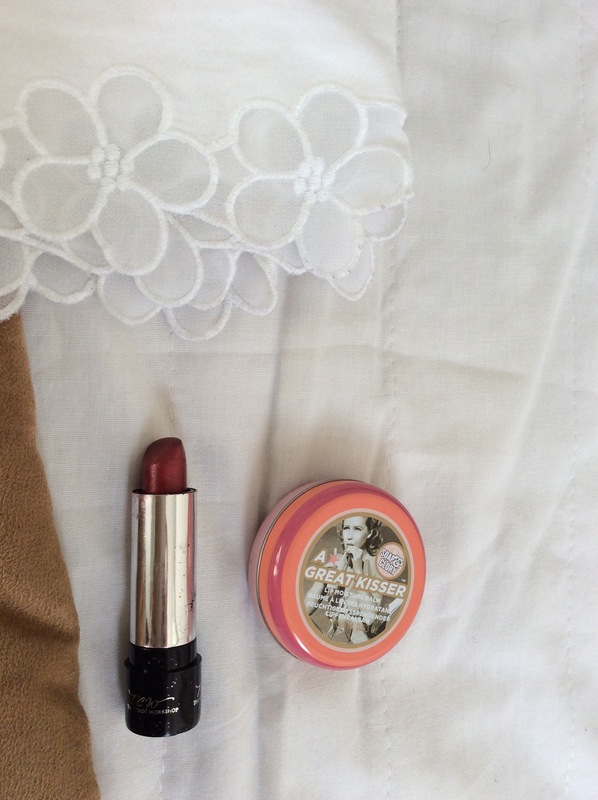 I also apply it before using this lipstick because it can be drying. It’s from the color workshop. I’ve never heard of it before but I got it for a present. As I have dark hair and pale-ish skin it looks quite nice. I hope you enjoyed this post! It’s a different layout and all, but don’t worry I will stick to that for other non outfit posts. I’m sure everyone’s got to the point where they think ” my desk is so messy I have to do something about this “. If not, you’re very lucky. I was like that last week and decided to sort out my whole room. First I did my desk which I am pretty proud of because it was so crowded! 2- I have fairy lights everywhere! These flowers are battery operated so they don’t get plugged in. They are stuck around my mirror and remind me of the film stars dressing room. There’s also some you can see around my bed! You’ll have to excuse the zebra wallpaper, it’s not really my thing anymore. 3- on the right side of my dressing table I have my bobby pins all stored in a mini jam jar. I also keep my 2 sprays and the fentimans rose lemonade ( which I’m in love with ) on there too. Obviously I have a bit of chocolate stored there as well! 4- I got this candle in primark for £2.50! It smells soooo nice. Plus it’s pink! 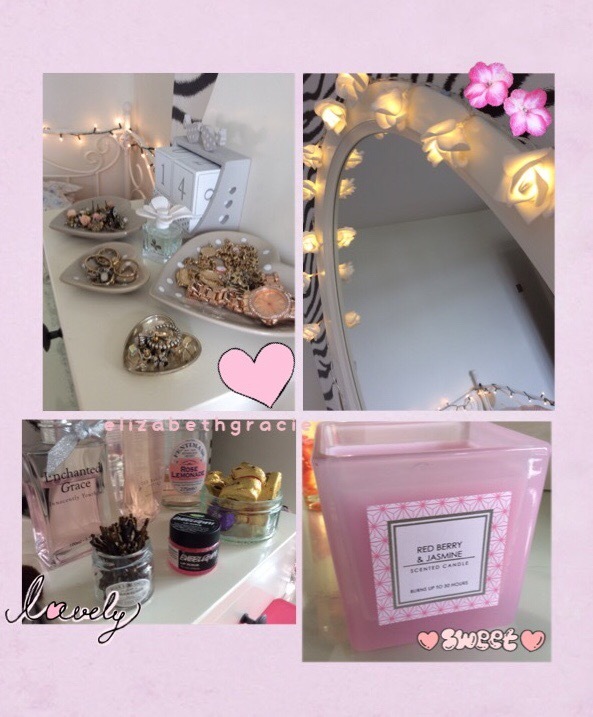 I love primark for home ware and I go there straight away because it’s all so nice! The spray in the background is Victoria’s Secret ‘ coconut passion ‘ and it is my favourite scent. It’s coconut and vanilla in one spray! If you’ve read my ‘about’ page you’ll know what I’m talking about. 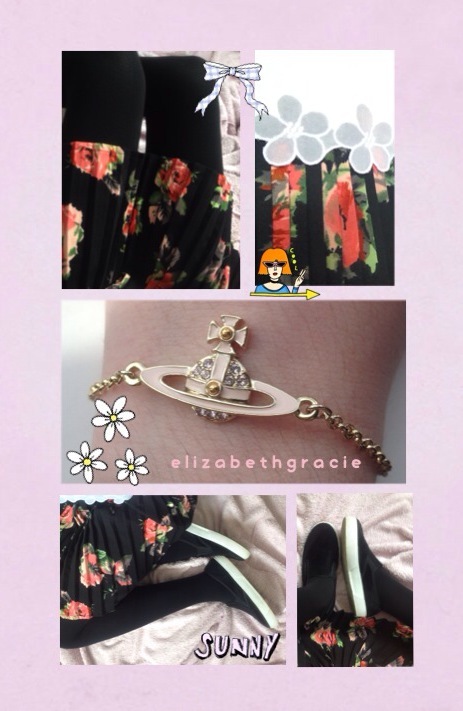 I did this post a couple of weeks ago and really enjoyed so I thought I’d show you what I’m wearing today! It’s quite cool but the air is warm so this is what I’ve chosen to put on. Ah, I’m in love with this skirt. It’s floral and pleated. It fits perfectly which I rarely find with skirts. My top is from topshop and I actually have two as one started to turn grey – as white does – so I found another! My shoes are also from topshop and are super comfy. There actually fluffy too! I would recommend wearing socks or tights with them though ( preferably dolly shoe socks / pop socks ) I bought my bracelet from Bicester village and you can check that post out here. I hope you enjoyed this post and have a great day! Hiiii everyone! Today I’ve got a little post about something I love! Perfume and body sprays! Yes it’s a strange love but I like to smell good so you know. These are my top 5 that I use regularly. 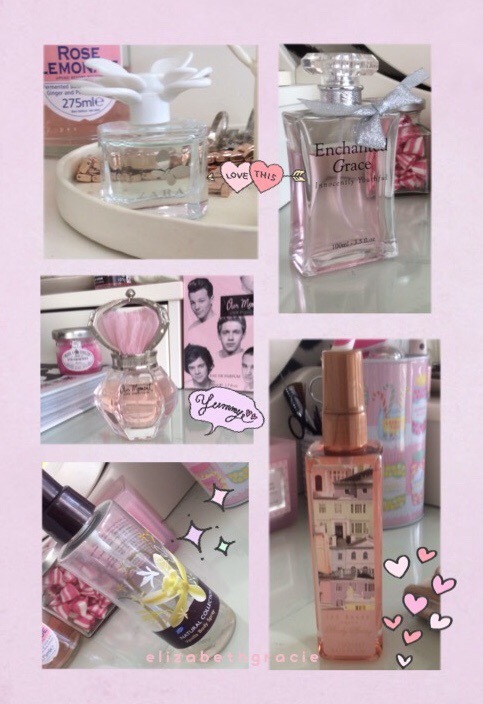 I usually wear my one direction perfume day to day because I have 3 bottles I may be a bit obsessed . I just love the sweet smell of it! Boots no longer sell this version of their vanilla spray which was just £2! They now sell a thinner taller bottle for £4.50 which smells nothing like the old one! I really don’t like the new one so I keep the tiny bit of this one I have left for special days. I sprayed this ted baker one ages ago and forgot the smell, I finally found it a few weeks ago and bought it straight away. It’s pink so why wouldn’t I buy it? The enchanted grace perfume was a present for Christmas and I have no idea where it’s from. I think I got it because it has my name on. I love the smell of it though, and once again it’s pink! My friend bought me this mini Zara perfume with some other things for my birthday and it smells gorgeous! It’s really fresh and great for spring. I’ll definitely be purchasing the bigger bottle!